With so many memorable children’s books flooding our bookshelves, it’s easy to allow one title to melt imperceptibly into the next. This collection of stories however possesses qualities that make them virtually unforgettable. Embrace these haunting experiences that will linger with you long after the final page. 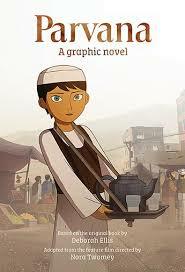 This graphic novel rendition of Ellis’ acclaimed novel, The Breadwinner (US name of Parvana), moved me to tears. 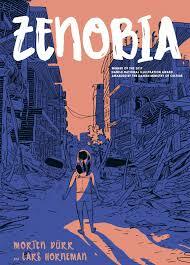 Emotionally charged and visually gratifying, this graphic novel ignites a need to know more and venture further. I have not read The Breadwinner yet but was so enamoured by this portrayal of Parvana’s story that I am now compelled to do so. There is a movie rendition too although I may not have to see it. This sombre tale about a girl who disguises herself as a boy to make a living in the stricken city of Kabul to support her family and reconnect with her imprisoned father is so convincingly expressed through Elllis’ stirring narrative and dramatic artwork (from which this version was adapted) that it leaves nothing wanting apart from a desire for Parvana’s salvation. The muted colour palette of dusty browns and ominous greys belie the hope that blossoms below the veneer of fear and repression. Orange flowers (the colour of hope) appear in many of the frames featuring Parvana and most strikingly, on the last page where they are seen springing from the crust of the desert. Parvana’s vibrant red blouse, the one she has never worn, representing hope and love, and a desire to be free of fear, is the catalyst for change. Dramatic, poignant and inexplicably beautiful, like Afghanistan’s people, this story is itself complete and will appeal to many even those (children) who are unaware of the historic atrocities leading up to Parvana’s story. Especially useful for those resistant to learning about history and reading full scale novels. 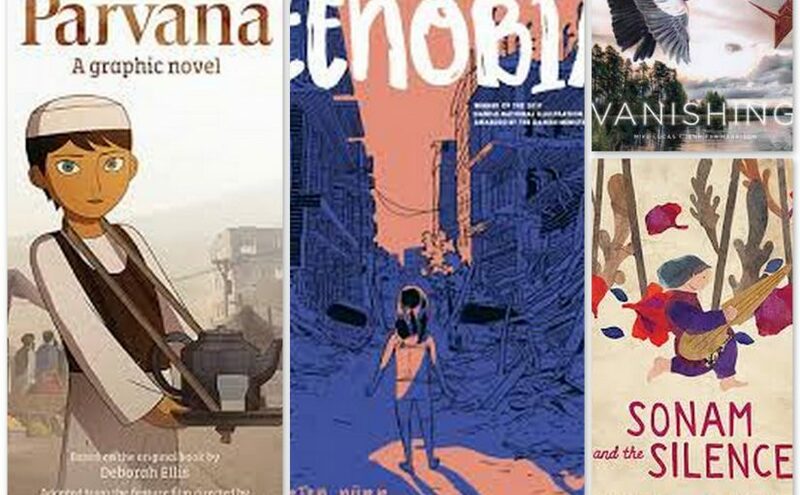 Zenobia is a children’s graphic novel that is as courageous and powerful as the great warrior queen of Syria herself was. It packs solid emotional punches but in dramatically quiet, measured ways. The ending is haunting and, for me, unexpected albeit, tragically anticipated. Nevertheless, Amina’s beliefs are cruelly tested; one day she is found alone by her Uncle who tries his best to extricate her from one hellish existence only to launch her into another by buying her passage on the refugee boat. Durr’s lean narrative allows space for speculation, dread, and hope to rise and fall with Amina beneath the waves. Her tragic final story, bookended with warm details from happier times, unfolds in a sea of smothering blues and greys. Horneman’s characterisation of Amina’s fellow refugees is almost corpse-like, their faces possessing a skeletal form that suggests the future outcome. In the end, Amina discovers Zenobia for herself; a sunken ship on the seabed of the Mediterranean, a haven perhaps that Amina is drawn to. This book is confronting and sad but under the immense mantel of futility there lies a certain peace. It is intimated that Amina, like so many others suffering her plight, does not make it to the place where ‘it will be okay and there are no soldiers…’ but that she has found her freedom at last. This will be an interesting book to share with younger readers in classroom situations and for older readers to ponder how war affects lives in a multitude of ways. Suitable for 7 years and above. 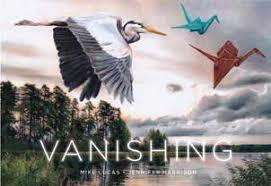 Stepping away from the atrocities of Middle Eastern conflicts, Vanishing is another book that highlights realities to elicit extreme emotion and promote understanding. Long before the presence of man, the creatures of the world co-existed perhaps not in complete harmony but with some kind of portentous balance. Man changed all that in ways that blithely ignored that balance. Vanishing aims to present young readers with the before and after of the demise of our natural world by illustrating how creatures, great and minuscule, lived, what they looked like and how they behaved. It is another colossal message for children to appreciate, how to live in harmony with all living things, but one delivered with absorbing beauty and care. Recommended for 4 – 9-year-olds. During the rule of Taliban in Afghanistan, the only music heard was the sounds of fear; the roar of gunfire, shouting, crazed traffic, oppressed misery. There is nothing melodious about seven-year-old, Sonam’s world. She sells gum in the dusty streets of Kabul and suffers the torment of her male-dominated life. Until one day, she happens across an old man with milky eyes living in a grove of mulberry and pomegranate trees. 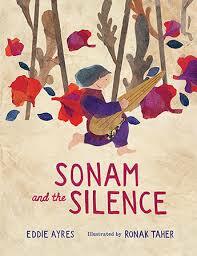 He introduces Sonam to music and makes her a rubab on which to play her own melodies. Sonam savours this forbidden joy with all her heart until her brother discovers her secret and destroys her instrument, forbidding her to play or sing again. This upset fills Sonam with a silence so deep and impenetrable that she cannot bear it and dares one day to reclaim a silence that is full of music. Sublime, meaningful, significant. This is a triumph of art, words and wisdom that demonstrates the irrepressible power of music and suggests to children that no matter what their circumstance or loss, true beauty and love will always dwell within. You just have to listen for it. Recommended for readers aged 6 – 10.